Farm revolution: from left, Peter Conasch (GS LLS) and Sydney Uni’s Esa Attia, Vinny do and Javier Martinez get acquainted with the digital farmhand robot. 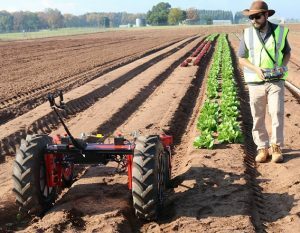 Greater Sydney growers will be the first to get a glimpse of a newly developed “digital farmhand” robot. A live demonstration of the low cost prototype robot developed by The University of Sydney’s Australian Centre for Field Robotics (ACFR) will be the highlight of an upcoming field day later this month. 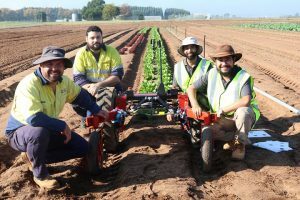 The workshop, to be run by Greater Sydney Local Land Services, will focus on managing soil borne disease on veggie farms using the robot prototype. Senior Land Services officer (irrigation) Matthew Plunkett said the prototype was designed to benefit small scale farming. “This machine could potentially be a game changer for growers, particularly those in the Sydney basin and while it is in the prototype stage it is a perfect opportunity for farmers and other industry partners to have input into its design and functional capabilities,” he said. ACFR Professor of Robotics and Intelligent Systems Salah Sukkarieh said the team were excited to debut the new technology in partnership with Greater Sydney Local Land Services. “The digital farmhand started from a philanthropic gift to the University of Sydney to look at developing low cost digital technologies that would support Australian farmers,’’ Prof Sukkarieh said. “It’s currently at a very high level prototype stage and over the coming months we will be demonstrating it on operational farms. “We believe it will help farmers with many of the laborious tasks as well as provide valuable crop information,” he said. Guest speakers from AUSVEG and ACFR will present on the day covering topics including soil borne disease management and control options, updates on exotic pest plant biosecurity as well as opportunities to boost on farm productivity through the VegNet NSW project. “Dr Len Tesoriero from NSW DPI will also present on the latest research and development carried out on a multi faceted approach to soil borne disease management,” Mr Plunkett said. The event will run from 12pm to 3:30pm at the Greater Sydney Demonstration Farm in Richmond on Friday, June 23. For further information or to RSVP email veg.network@lls.nsw.gov.au or visit the Greater Sydney Local Land Services website here. The Greater Sydney Local Land Services VegNet NSW project is funded by Hort Innovation using the vegetable levy and funding from the federal government. Get to work: Javier Martinez takes the digital farmhand robot prototype for a spin.